I love a good deal – especially when it comes to decorating. When you're a student or young professional on a budget, bargain hunting is the name of the game. You're more likely to find me scouring discount retailers, thrift shops, antique stores, and Craigslist rather than Pottery Barn, Crate & Barrel, and West Elm. Those home stores – as lovely as they are – would take a big toll on my bank account. And while I say I may shop there someday with my "future disposal income"... the truth is that I'm a bargain shopper through and through. I decided to go in a young, fresh direction and create an apartment bedroom I'd be happy to call my own. Eclectic furniture pairings. Floral patterns. Bohemian mixing and matching. Except for a few accessories like the antler and vintage fan on the dresser top, brick backdrop, pile of books, and stack of magazines... everything in this Olioboard is from Kirkland's! So let's run down some of the savings, shall we? All five of those Kirkland's finds come to roughly $670, compared to a whopping $1536 with the Pottery Barn, West Elm, PB Teen, and Grandin Road items. And the savings don't have to stop there. Pillows, rugs, furniture, mirrors, curtains and decorative accessories all run less at Kirkland's than those other retailers. I know that BIG savings speak for themselves – but what about the style? 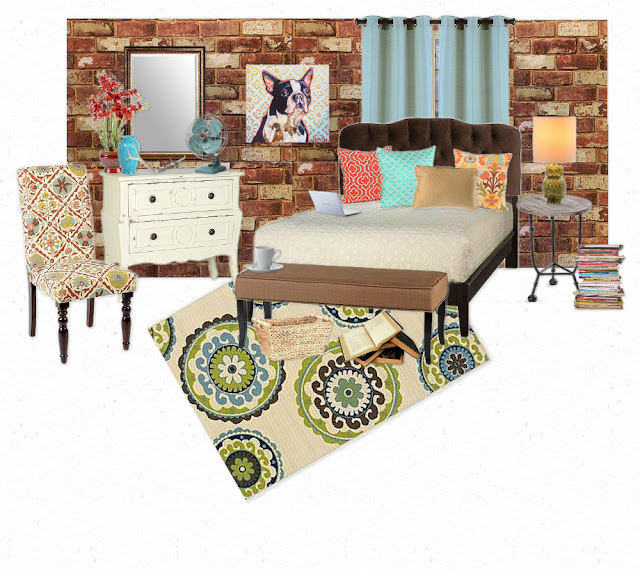 I love the young, fresh, eclectic bedroom I was able to pull together. What Kirkland's item(s) would you integrate into your decor?